Launching the debate was Minister of Foreign Affairs Edgars Rinkēvičs, freshly installed the previous day for another stint at the job he has held since 2011, making him Latvia's longest-serving foreign minister. In a wide ranging address to deputies and a fair proportion of the foreign diplomatic corps occupying the press gallery, Rinkēvičs summed up the challenges to be tackled in the coming year, placing particular emphasis on the need to negotiate the United Kingdom's so-called "Brexit" process from the European Union, to ensure continued unity in international organizations and to persuade deputies that hopes of winning a temporary place on the UN Security Council in 2026-7 would be more than just a diplomatic feather in the cap. The international scene remains challenging, Rinkēvičs said: "Even in countries with strong democracies, expressions of intolerance, aggression and hate speech are rapidly increasing. A wave of populism has not stopped across the world, seeking to distort reality and provide the public with unfounded illusions, half-truths or even open lies. Similarly, targeted and controlled disinformation campaigns by individual countries continue to try to influence political processes in other countries." "Last year in the Sea of Azov, Russia demonstrated that it continued its aggression against Ukraine and failed to comply with international law," Rinkēvičs said, while later expressing hopes that relations between Latvia and Russia could improve. The minister also attempted to play down the clear differences between the White House and Brussels, describing them as "a family dispute, but in almost all major issues the US has received far more support from Europe and Europe from the US than any other regions in the world." Latvia "supports a significant strengthening of the US military presence in Poland. These steps should strengthen the security of both the region and the whole Alliance," he said. "It's no secret that in recent years the European Union has been working in a crisis regime," the minister said, warning that the EU "cannot be divided into small and large interest groups." He also noted that "Brexit cannot become the reason for a disproportionate reduction in the amount of cohesion funding" and agricultural sector payments in the next multi-annual budget of the European Union. Offering continued support to Ukraine, Rinkēvičs said "Russia is unable to accept Ukraine's choice to form its own independent country" and that its actions there continue to be a threat to the wider region. "Our relationship with the Russian Federation is complicated," he said. "We will never accept Russia's actions, in violation of the principles of international law, and using force against its neighbors. We cannot accept Russia's policy of informational war, which seeks to undermine the fundamental principles of democracy, human rights and the rule of law." "We are interested in cooperating with Russia in areas where values and interests are aligned. A good neighbor is interested in the well-being of his neighbor, so we want Russia to become a democratic and prosperous country that respects international law," he said. 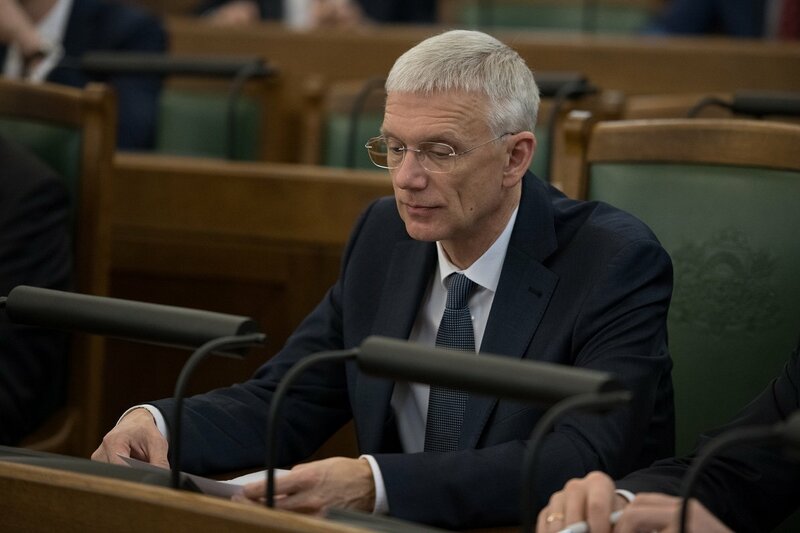 New Prime Minister Krišjānis Kariņš responded to the presentation by underlining the priorities of his government: cleaning up the financial sector at top speed, and maintaining the country's Euro-Atlantic course. Money-laundering and other financial crimes represent "a potential threat... to all of society" Kariņš said, warning that "We do not have much time [to put things right] but the government will do everything possible" and was taking the matter "very seriously." But maintaining Latvia's "western path, western orientation" was his main theme. "This is and remains ironclad as our country's foreign policy path. This path is based on values - values that we share with all of our allies. based on democracy, rule of law and human rights. A value-based orientation," Kariņš asserted.